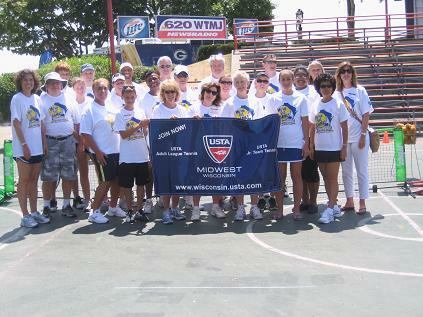 The Wisconsin Tennis Association appeared at Milwaukee’s Summerfest with a fun-filled, exciting tennis extravaganza. Tennis was featured at the ULINE SportsZone, Saturday, July 7 and Sunday, July 8 from 12:00-4:00. Tennis was introduced to the largest crowd ever, with the greatest number of new memberships, prizes, give-aways, outstanding volunteers and tennis fun for all! Amy Richmond, who organized the event. Amy devoted considerable time, effort, and preparation, in addition to recruiting outstanding volunteers. Jay Massart and Joan Meidl for donating equipment for the weekend. Laura Hildebrandt and Jeff Watts for their voices and expertise as MCs of the event. They attracted a crowd with fun and good humor. More than 60 volunteers who dedicated the weekend to teach tennis to youth and adults. It was the most successful event the WTA has ever hosted. More than 500 people participated, learning the sport of tennis on short courts with practice balls, racquets and tennis fun for all. Over 120 youth 10 and Under became FREE members of the USTA. There were 6 NEW 11 and Older USTA Memberships. All participants received ear buds donated by USTA Midwest. New 10 and Under members received a FREE frisbee from the WTA along with the FREE membership. New members 11 and older received a FREE racquet and t-shirt from the WTA. The Beat the Pro Contest was great fun. Prizes included t-shirts, can of balls, pens and Prince stickers. Welcome to all our new members. Enjoy your membership and the fun of the USTA!